Tough, interactive tug and shake toys that dogs love. Has knotted ropes inside for a realistic feel, which extend outside the toy creating tug handles at both ends. 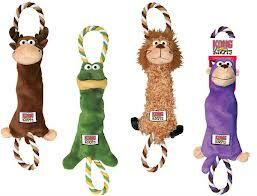 Unique design creates a captivating variety of textures and resistance that dogs love, and it contains a squeaker for added fun.